Sponsored by University of Illinois Men’s Gymnastics. If it is April, that means the calendar is jam-packed! What ISN’T there to do this weekend? 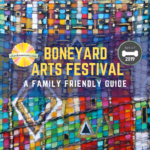 Our prime picks for family-friendly fun during the Boneyard Arts Festival. Best of all: FREE. 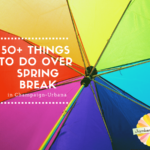 Our ideas for Spring Break family fun in and around the Champaign-Urbana area. Good news: much of it is FREE! 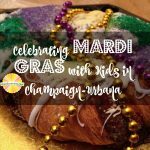 Beads, masks, King’s cake and more in Champaign-Urbana. Sponsored by Krannert Center for the Performing Arts. Spring is just around the corner in Champaign-Urbana. As usual, there is a ton of family fun to be had this weekend!